Like meeting up with old friends. Jonathan Stroud’s second Lockwood & Co novel returns the reader to some favourite characters, and you just know you will have fun together. Again. 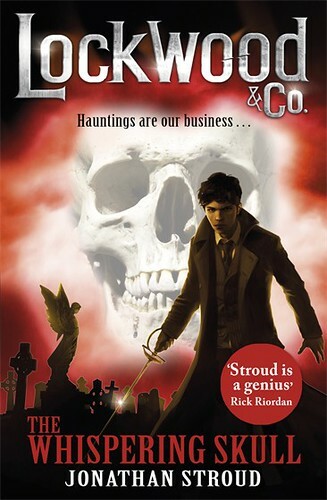 Lockwood and Lucy and George have a nicely functioning style of searching for ghosts and getting rid of them, making London and the world a safer place. A year has passed since Lucy joined the company (please tell me this doesn’t mean they will soon be too old to deal with ghosts? ), and they are about to start work on a new and dangerous hunt for a mirror that kills. The three keep running into their rivals from Fittes, and this new case sees our friends actually having to cooperate with them. But it’s not always those who seem to be your enemy that you ought to worry about the most. What about the – illegal – green skull in the jar they keep in the house? Friend or foe? You have to admire Jonathan for creating this modern day, alternative London, which at the same time feels really Victorian. His core group of characters might follow the standard pattern of two boys and one girl, but Lucy as the narrator makes for a different kind of story. She’s also very talented. Perhaps not more so than the others, but their skills complement each other. This is quality reading for young and old. Bring on those ghosts, but first hand me my rapier! This entry was posted in Authors, Books, Horror, Humour, Reading, Review and tagged Jonathan Stroud. Bookmark the permalink. I haven’t read Lockwood yet, but thanks for reminding me about Jonathan Stroud.